Question: The graph below shows the number of books read by men and women at Burnaby Public Library from 2011 to 2014. Summarise the information by selecting and reporting the main features, and make comparisons where relevant. 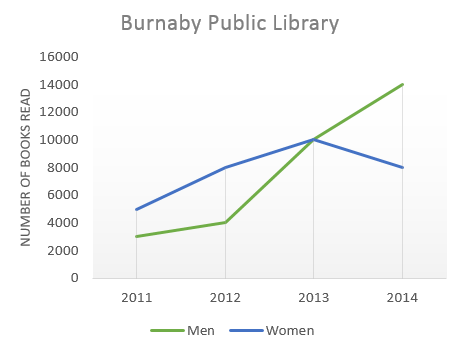 The line graph illustrates how many books male and female readers read at Burnaby Public Library between 2011 and 2014. Overall, the number of books read by both genders increased over the period shown. By contrast, although women were shown to read more books than men at the beginning of the period, the number of books men read surpassed the one of women in the last two years. In 2011, men perused approximately 3000 books, which was about 2000 less than the figure for women. Over the following three years, although both genders read more and more books per year, the number of books read by men rose more rapidly, overtaking the figure of female readers in 2013 at roughly 10000 books. By 2014, whereas men at Burnaby Public Library continues to read more books, peaking to just under 14000, women readers became less active with the number of books read falling by 2000 ones. The line graph illustrates how many books male and female readers read at the Burnaby Public Library between 2011 and 2014. Overall, the number of books read by both genders increased over the period shown. By contrast, although women were shown to read more books than men at the beginning of the period, the number of books men read surpassed the one that of the women in the last two years. In 2011, men perused (When you peruse a book, you don't really read it.) approximately 3000 books, which was about 2000 less than the figure for women. Over the following three years, although both genders read more and more books per year, the number of books read by men rose more rapidly, overtaking the number read by figure of female readers in 2013 at roughly 10000 books. By 2014, whereas men at Burnaby Public Library continues to read more books, peaking (wrong word) to just under 14000, women readers became less active with the number of books read falling by 2000 ones. 1. In 2013, both men and women read the same number of books, about 10,000. 2. From 2011 to 2013, men more than tripled the number of books, while the number for women doubled read, from 3,000 to 10,000 and 5,000 to 10,000 respectively. 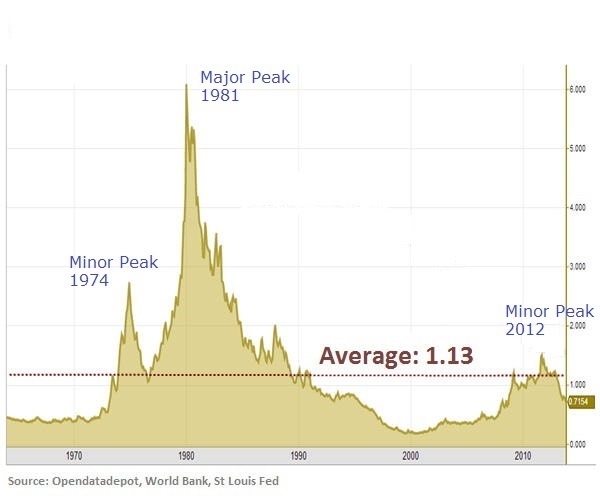 Peak: A peak is seen on a line graph when the values both before and after the peak are smaller. IF the highest value is at the end of a graph, you have no idea if it is a peak or not. IELTS Writing Task 1: Adult Education.